Today Microsoft released Windows 8 RTM to hardware and software manufacturers. 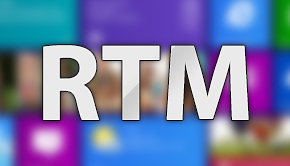 If you’re unaware, once a version of Windows reaches RTM status, it basically means Microsoft has finished development and is ready for manufacturers to begin finalizing drivers and software for the new platform. That being said, since we are early into the RTM stages, many drivers are still unstable and we do not recommend running Windows 8 on your main system. Above all, the RTM release of Windows 8 will not be upgradeable upon final release, and the evaluation period has been set to 90 days. Disclaimers aside, it’s time to talk about some new and exciting features found in the RTM release. One of the most noticeable design changes in Windows 8 is the lack of an Aero UI. Microsoft has opted for a flat, single color design to replace the 7-year-old Aero interface we were introduced to in July 2005. Just like Aero, you’ll be able to set custom colors for UI elements in Windows 8. These colors can be set in the new control panel, and appear in the new fullscreen start menu and on any non fullscreen app’s window borders. The new personalization options also allow you to set custom images on the lock screen, and various preset designs for your start menu. On the software side of things, Microsoft has officially launched the new Windows Store with both free and paid apps. This will be the first official software store available for Windows, and will have a myriad of popular software titles available from launch day. In the store you’ll find some of your favorite titles updated to match the new UI, previously called metro, for your new Windows 8 devices. Internet Explorer has hit its final release version in the RTM build of Windows 8. IE 10 will available in standard windowed mode, and a new fullscreen interface that supports various gestures optimized for tablets. This will allow both desktop and tablet users who are fans of IE use the software on their hardware platform of choice. Keep in mind Google has also recently released a build of Chrome that supports the new Windows 8 UI, and we definitely suggest trying it out if you don’t particularly like Internet Explorer. One interesting feature Microsoft also released in the RTM build is Windows To Go. This was a feature that was previously mentioned at various keynotes, but until now, it has not been available for testing. Windows To Go will allow you to take Windows 8 with you on a flash drive and run the operating system on any system that can boot from USB. This is a great feature for users that need to take their operating environment with them and need to use certain pieces of software on other systems when they are not around their workstation. If you’re an MSDN or TechNet subscriber, you can get your hands on Windows 8 RTM immediately, but again driver support is very limited and you will not be able to upgrade from the RTM install when Windows 8 is officially released on October 26, 2012.